I have absolutely no idea if the Hyperloop is even close to feasible. I’m not an engineer, and I know bupkis about such things. I do tend to be somebody who prefers transit to cars; I love the convenience of trains when I’m in Europe, I wish it more replicable here than we seem to be willing to make it, I hate living in a part of the country that’s difficult to get in and out of without a car, and I hate the sheer waste of hours that travel becomes when one is behind the wheel. I had to go to Memphis a couple of years ago, it was an absolutely ridiculous drive that took about nine hours each way that I just plain didn’t have to give it, but there was no other way to get there. A regional flight, counterintuitively, was going to cost more than the fare for flying to either coast. That was nine hours each way that could have been spent correcting, reading, sleeping, whatever. So, yeah, big ideas surrounding transit tend to be appealing to me. I’m thrilled because this is a conversation about solving big issues with big ideas and not with cautious, incremental, compromised, and cynical status quo concepts. This is unfamiliar, it’s exciting, it’s futuristic, it’s unquestionably beneficial, and there is no technological reason that it can’t work. Why tear it down? Just build it… It’s tempting to blame “Internet culture” for the creeping negativity and cynicism that stops us from ever imagining more, but I believe that the chorus of “no’s” from Twitter and the comments section only amplifies a depressing point of view that’s infected America since the 1970s. We’re afraid. We hate science. We have no heroes. We don’t believe that we are capable of more. I’ve seen precisely the attitude this author complains about firsthand with respect to issues of transit; I’m from Seattle, after all, where they want nice things but don’t want to pay for them or have poor people riding on them. I’ve also seen this attitude in other arenas, and I think what the culprit is in a lot of cases is that the status quo is at a point where most people who would bother to say anything that would be heard feel like they have things sufficiently their way to not care, and they don’t want to hear how it could be “better”. “Better” is not going to be better for them, not when in order for it to be better they’d have to make an adjustment away from their current comfort zone. What’s the point of a public transit system like this when there are so many reasons to just not bother fixing what ain’t broke? Never mind that there are ways where it is broke, or will be; the cure is going to be worse than the disease and not worth it. We’ll adjust in other ways. I love what I’ve seen of this… but I can see it getting gutted by the petty nitpicking that always chips away at big projects like this. Somebody doesn’t want construction in their neighborhood. Somebody else doesn’t want the view from their lanai to be affected. Somebody else complains loudly about the types of people (“I’m not racist, but…”) who will be riding. And before you know it, a bold, forward-thinking mass transit project becomes another cutback in bus services. Geez, I just depressed myself. Yeah, no kidding. “…a bold, forward-thinking mass transit project becomes another cutback in bus services.” Ouch. Ouch because it’s true. One of the most frustrating personal experiences I’ve had with this kind of “nothing to see here, move along” attitude towards big ideas is with church building, and I’m not going to bother being disingenuously circumspect here, since one can very easily find out where I went to church through last December and find some of the things I wrote about my participation on the building committee, and the broad strokes are all public record anyway via the minutes of parish council and building committee meetings. I posted this about a year and a half ago, and I have to imagine that, reading between the lines, some of the sources of tension are clear. I’ll note that I said back in March of 2012 that I hoped I would have something concrete to talk about in “the coming weeks”; well, there never was anything to say. We brought Andrew Gould, as I wrote about at the time (giving a fairly frank summary of efforts up to that point), to All Saints in January 2010, and he very much talked the language of big ideas. Right now you’re a mission church without a church, and you’ve got to build something that actually serves your function as a mission church. This is what’s in the tradition to build, this is what I would design for your property, these are the considerations you need to put above all others. You need to build a beautiful church that is first and foremost for the worship of God; there’s a right way we worship, which means there’s a right way we build. I again refer you to my “Notes from the building committee” piece so that you may read between the lines for some of the controversy that emerged from Andrew’s proposal, but I’ll go into some detail about one part of the problem. The thing of it is, when people decide they don’t want to hear a big idea, one of the tactics is to glom onto details they don’t like, inflate their importance, and make them undetachable from the whole so that the entire idea can be very efficiently shot down. In the case of Andrew’s concept, his detractors immediately focused on a particular element that was his way of handling a problem we had asked him to spitball a solution for in the first place. The existing building was separated from the proposed location of the permanent church by something of a ravine; how do we connect the two locations so that the existing building isn’t just abandoned? Andrew’s solution was a bridge, inspired by the Indiana tradition of covered bridges. Part of his vision, too, was to make All Saints’ property something of a destination, turning the remote location into something of an advantage. Well, for a segment of the congregation who didn’t want to build in the first place and who saw the remote nature of our location as a feature and not a bug, the bridge became an easy blunt instrument to swing around as a dealbreaker. “Well, wouldn’t that be dangerous? Would you really want your kids going across that? What kind of money are we going to spend on a bridge when what we claim we need is a building, and I’m not convinced we really need that to begin with?” ad nauseam. When it became clear that Andrew’s big ideas had become points of digging in against building altogether, there wasn’t much of a choice but to quietly drop his concept entirely and try to find another way to move forward. A compromise architect was found who seemed interested in the project and who brought some good things to the table, but after an initial positive meeting in July 2011, other factors kept a contract from being delivered until August 2012. There was some hope from the building committee chair that we could sign the contract quickly and have drawings by Christmas, but politics prevailed again; the building committee didn’t even meet to discuss this contract until October 2012, some parties wanted significant revisions to the contract that would have to be negotiated, and to the best of my knowledge there has been no additional movement forward with the project in the ten months since, at least not as of the end of July. Meanwhile, the stopgap measure to create more space in our temporary nave was to leave the collapsible wall between the nave and the fellowship space open permanently, with a curtain installed on a track that could be moved around to subdivide the space as necessary. As a friend of mine put it, the net effect was to make All Saints feel even more like just a big living room that happened to have an iconostasis at the front. Effectively, a bold, forward-thinking church building project became a curtain. And, not unlike the people who say that only poor people and people who already ride the bus are going to bother riding mass transit, making it a solution looking for a problem, one of the things that was common to hear in response to arguments for building was that most of our “extra” people were “just college students”, and eventually the people we can’t fit will leave — problem solved. Big ideas, it seems to me, are easy to argue about when they make the wrong people uncomfortable, or when they’re trying to solve a problem that the people who matter don’t care about, while conversely the people who do care about it don’t matter. Maybe it also keeps unnecessary change from happening too fast, so maybe this is something to be thankful for, but I will say that sometimes I have a hard time believing that we were actually able to go to the moon. I don’t know who you might be, or what your circumstances are. Regardless, if you’re an Orthodox Christian (or are in the process of converting) and a musician, I’d like to invite you to come to Bloomington, Indiana. Maybe, it being college decision time of year, you’re a graduating high school senior who has grown up singing in your choir or chanting at your analogion, you’re trying to figure out which of your many college acceptance offers to take, and Indiana University is one of your options. Maybe you’re a grad student who’s considering coming here. Maybe you’re an adult who’s at a transitional point for one reason or another and Bloomington has something else you’re looking for. I really have absolutely no idea to whom this invitation might speak, but I feel like it must be extended. I will be frank. I have absolutely nothing to offer you. I have no means by which to negotiate a recruitment package. My own stipend is modest at best, and it’s as much as can responsibly fit into the parish’s budget, so I have no way to pay soloists or section leaders. In the long term, I am working on a way that eventually there might be scholarships that we can offer to incoming students who are interested in Orthodox music and are willing to make a commitment to the choir while they’re here, but that’s a few years off yet at least. It’s a building that’s a challenge to sing in, to put it mildly. I will expect you to make music here a priority — at the very least, to come to rehearsals on Thursday evenings, and I will hope that you choose to come to Vespers and Matins as well as Divine Liturgy. You will need to have a car, because the parish isn’t accessible any other way. However, we are trying to build something at All Saints. We’re trying to develop the music at All Saints into something we’re proud of, to turn All Saints into a home for Orthodox music fitting for the only Orthodox church in the town that hosts one of the best schools of music in the United States. Right now, for a number of reasons, we’re focusing on Byzantine chant, and trying to do that as well as we can with what resources we have available. We’re hoping that very soon we will have concrete developments that we can announce with regard to a new building that will be, if all goes well, the best place to sing in Bloomington. We’re not there yet, but we’re trying as hard as we can to get there as soon as we can. The St. John of Damascus Society — and we’re still waiting for our tax-exempt status to come back, which is why I haven’t made any humongous formal announcement about anything we’re doing quite yet — is part of how we’re trying to get there. So, again, if you’re an Orthodox Christian with an interest in and an aptitude for our liturgical music, and you for some reason or another might be considering a move, I invite you to consider Bloomington, Indiana. There is an Orthodox church here, we’re hoping to be able to carry out some big dreams, and we need your help to do it, if you’re so inclined to take a leap of faith. I’ve got no idea at all who you might be that you are in a station in life where what I have to say might speak to you. There’s nothing to lose by trying at least — but if there might be people out there and I don’t try, then nothing will have been accomplished. So, if you’re out there, give it some thought and some prayer. If you have questions, you can reach me at rrbarret AT indiana . edu. I got a phone call from my priest a week after Thanksgiving with a proposed Nativity schedule of Royal Hours with Divine Liturgy Friday morning, with Matins and Divine Liturgy Saturday evening. I gently suggested in return that it would be good to verify that the Divine Liturgy he was suggesting for Friday morning wasn’t the one we weren’t supposed to have Friday morning, since Nativity fell on a Sunday this year. More importantly, however, I asked him, why would we not want to have our festal liturgy the morning of, the one time in six years when our usual reasons for not doing so aren’t applicable? This reasoning apparently made sense, because when the December calendar for the parish was published, the Nativity weekend included Royal Hours Friday morning, Divine Liturgy Saturday morning, Vespers Saturday evening, and Matins and Liturgy Sunday morning. Then, the Friday before last, I asked him, hey, if I can guarantee the presence of bread and wine, would you be up for doing Litya/Artoklasia the next couple of Saturdays, given that they are festal observances where it would be appropriate? Yes, he said, and so I baked the five loaves both Saturdays and donated a bottle of Greek ecclesiastical wine I still had in the house. For the Vespers and the Liturgy for Nativity, I even did something I don’t normally do for purposes of voice saving, the Old Testament and Epistle readings. My cardinal rule with those is — thank you, John Boyer — “If you think you’re going too slow, slow down,” and it’s really tempting in a space with no resonance whatsoever to speed up, but I didn’t. Saturday evening, even with only three of the Old Testament readings, my — shall we say — unhurried ekphonesis plus Litya and Artoklasia and all of the extra stuff for Nativity meant that Vespers clocked in at an hour and forty-five minutes, easily the longest Vespers service that has ever been served at All Saints. It was probably about nine hours of singing all told, from Friday through Sunday morning. Next year, with Christmas falling on a Monday, I may suggest that we just do a real All-Night Vigil (Small Compline, Great Vespers, Matins, Divine Liturgy), but I suspect that will go over like a lead balloon. Anyway, as soon as we got home after church on Sunday we had to start in on the goose. Cooking plus company meant that it was about 10:45pm before we actually got around to any gift unwrapping. I’ll note that I find the whole discussion about whether or not churches should close on Christmas when it falls on Sunday a little odd. To the extent that Christmas (or Easter, for that matter) are components of a liturgical year that has been largely abandoned, why should Christmas be given any special treatment one way or the other? 25 December is less “Jesus’ birthday” than it is the first day of the twelve day liturgical celebration of the Feast of the Nativity of Christ, which really is something a bit different, coming as it does after a penitential fasting season and coming right before Epiphany/Theophany. I suppose Christmas really does primarily function as a family holiday without that context, so it may as well be one. Jesus may certainly be the reason for the season, but the expression of that season is based in an ecclesiastical setting, and if you don’t have that setting (and/or if your first criterion is whether or not service times are “kid friendly”, which I’ve heard as a reason for why Midnight Mass in Catholic circles is downplayed these days), what’s all the fuss about whether or not the churches are open? Can you keep the Christ in Christmas without also keeping the Mass in it, at least and have it mean the same thing? If we’re taking the liturgical celebration of the Incarnation of Christ with all of its beautiful and glorious imagery and theology and reversals of human wisdom and so on and having to recast it as Jesus’ birthday party in order for it to make any sense in our current world, then is it really Christmas, or is it basically a cultural winter holiday with distant Christian roots where it would be nice if we emphasized them more? On the “kid-friendly” point — my recollection is that I didn’t sleep much Christmas Eve as a little kid because of the anticipation of Christmas morning. So if your kid is going to be up all night with a lot of nervous energy to begin with, it seems to me an All-Night Vigil starting at 10pm Christmas Eve and going until 5am is perfect. You’ll all be getting home right about the time the kid was going to be up anyway, so what’s the problem? A commenter recently weighed in on one of my postings on church architecture that Christ chose to be born in a lowly cave, so I’ll use that as the pivot from Christmas to my next set of thoughts. St. Andrew’s Orthodox Church in Riverside, CA has gotten a fair amount of attention lately over their new church building. It is worth pointing out, however, that not all of the attention has been positive. There’s a good amount here worth thinking about, and I’ve been part of the discussion about building at my own parish for the last six years, so here goes. 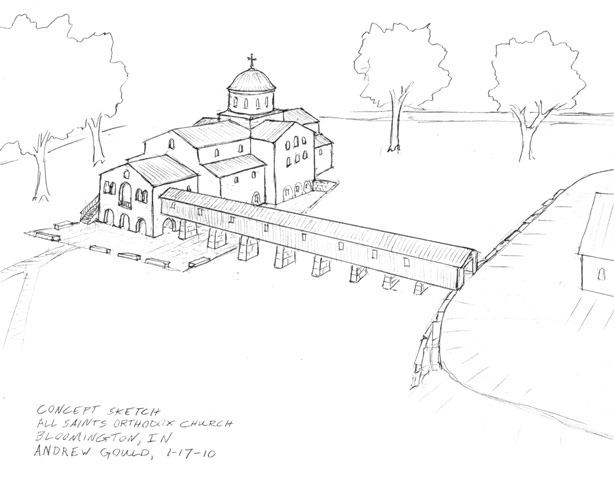 A good twelve years or so ago, when I was attending St. Margaret’s Episcopal Church in Factoria, one of Bellevue’s commercial districts, they were embarking on a capital campaign to tear down the old nave and build a new one. The priest talked about the vision, what it would cost, and what the timeline was. The priest was clearly expecting the question. “Well,” he said, “a couple of years ago we went through the exercise of asking, where do we think God is calling us to be as a parish in ten years? We looked at the ministries we support, how we’re going to continue supporting them, how we expect them to grow, and the other ministries we want to be able to support, and it was clear to us that in order to do these things, our current facilities were inadequate. So, that’s why the plan is to build.” The woman who asked the question clearly wasn’t buying the answer, but at least there was an answer. Now, in my time in Episcopal circles, one thing you could never fault them on was process. Results — well, there they could be a little shakier. St. Margaret’s built a new church, most certainly — but they fell noticeably short of the ten year goal, from everything I’ve seen since I moved away in 2003. They lost people while they were building, the priest who married us left under some very unpleasant circumstances which caused more people to leave, and the series of interim leaders who followed meant that more people left because of uncertainty about where the parish was going. Bottom line is, the priest gave a good answer to a good question, that there was a plan and they were following it, and this plan will allow a both/and approach, but it still turned out to be the wrong thing to do, and right now the parish is drowning in debt (at least, that’s the picture I get from the website devoted to their debt reduction initiative). I’ve written about this before, but one thing I experienced in Greece was that the poor congregate around churches. They hang out by the entrance of the narthex, some will sit quietly with hands up, some will hustle you, some will have something to try to sell, but the simple fact of the matter is that you can’t go into an urban church without having to interact with those whom Christ told you to feed and clothe on your way in. This is a good thing; their presence convicts you and hopefully prompts you to do something about it. We’re isolated from that experience in suburban churches, and to our own detriment. At All Saints, we’re not a suburban church, we’re more of an exurban church. We’re in the middle of nowhere — no nice way to put it. There’s no way to get there if you don’t have a car — we’re in unincorporated county, so the closest bus stop is two and a half miles away, and trying to ride a bicycle or walk on these roads would be insane. We’re at the intersection of rural roads that are such that, even if I lived across the street, I’d still drive. We had a visiting priest tell us once, “Your remote location is a gift — it means you aren’t bothered by the concerns of being in a city like drug dealers and gangs and things like that.” This was some time after my return from Greece, and the first thing that went through my head was that this priest had sorely missed the point. The Church and the church building are not supposed to isolate us from the people we’re serving; they are supposed to help us serve them better. Right? In Orthodox Christianity, as I understand it, the building is supposed to serve a number of functions — iconographic, practical, liturgical, and so on. Unfortunately, it seems like the conversations we have to have about building are required to assume that those functions have little to no bearing on what you’re actually going to be able to build, because we’re not actually building Orthodox churches in an Orthodox context — we’re building Orthodox shells in a Protestant context. What do I mean by that? Well, St. Irene Church in Athens does not have a fellowship hall, it does not have a set of Sunday school classrooms, it does not have a gym. It has offices for the priest; beyond that, it’s a church. By contrast, in the setting we have in this country, we’re supposed to have all of these other auxiliary services, and the fact is that they’re often the tail that wags the dog. At All Saints, we built a shoebox that looks like an office building first. It was envisioned as being the classroom wing of a three-wing facility that included a church; we built that first because the conventional wisdom was — so I’m told — “People come to church for church, but they stay for everything else a church does. This building allows us to do some of those other things while getting by as a church.” I had a conversation a week ago or so about another Orthodox building project where they’re building the hall first — the priest has evidently said that there’s simply no advantage in starting out by building the church, precisely because it’s the part everybody wants. Without that carrot to dangle, there will be no incentive to finish the project. So, we’re marginalizing our primary liturgical function because it’s just not practical when everybody is conditioned by the Protestant landscape to expect a buffet of secondary functions. Okay, so, fine, that’s the theological theory. All Saints has a complex relationship with those in need. First of all, we’re mostly a lower-middle to lower-class parish, so many of the needy whom the parish serves are its own parishioners. Second, we’re the first church listed in the Yellow Pages, so we tend to be the first called when people are calling churches looking for assistance of some kind. Our priest does what he can; our previous priest had a secular retirement plus the stipend the parish gave him, so he was in something of a position to give out of his own pocket to such people, but such are not the current priest’s circumstances. He tries to have a stock of prepaid debit cards and food on hand to be able to do something when people call; we used to have a relationship with a local homeless mission, and I’m not certain why we don’t anymore. A few years ago there was a discussion about trying to form some kind of an ecumenical effort in Bloomington to do more for the homeless, but the response the priest got from other pastors was, “Sorry, that’s just not going to work in this town.” Something the priest has started doing with catechumens is instructing them to have a bag of food in their cars that they can give to people who approach them on the street, and I think that’s a great step to be taking. Could we do more? Doubtless — who couldn’t? — but the structures aren’t really in place, and All Saints is not in a position to bear the administrative weight. We could hold a soup kitchen at All Saints, but who would come, and how would they get there? You need to do such things in the places where the people are, and that’s something we can’t do under current conditions. The relationship with building is even more complex. Anything we build will take a capital campaign, and those are scary words for a lot of our people. The hard reality is that even more than St. Margaret’s in 1999, we have very little we’re able to do in our current facility. It doesn’t serve our needs liturgically, iconographically, or practically, beyond simply being four walls and a roof that’s sort of able to house services. At the very least, we can’t really grow without building, but there are parishioners who are adamant that we must grow before we can build. In a smallish community like ours, the big killer of any effort is apathy rather than opposition — opposition is at least engaging in the conversation. Apathy is not even acknowledging that there’s a conversation. Despite efforts over the years to get a conversation going about moving towards the permanent church building, there’s really no popular impetus to do anything. Some people have suggested that it might be better to talk about how we can expand the current space, but it just wasn’t designed in a way that would make that possible and cost-effective. 11 years ago, when they built it, they figured that it would allow them to grow to a point where they would be able to build the rest of it within five years, but neither the location nor the facilities are conducive to growth, and the realities of a college town with no real economic diversity to speak of have left the All Saints demographic in a position where many of them have had to leave Bloomington rather than stay and help grow the community they were part of establishing. Somebody told me a few days ago that the parcel of land in the middle of nowhere was partially justified as being someplace where maybe an archdiocesan retreat center could eventually be built, thus being a source of some income for the parish, but… well, it all takes money, money that people have not been thrilled about parting with for the last 11 years. So, six years ago, our priest said, “Now’s the time, we’re going to do it,” and six years later, we haven’t pounded a single nail. Will we ever? Hard to say. All Saints is an experiment, some say, in seeing if you can successfully plant an Orthodox church someplace in America where there have never been the usual reasons to have one. This is something of a strange way to put it to me; it’s clear that there has been a large community of Greeks in Bloomington since the early 20th century, they just apparently never felt terribly compelled to build a church. In any event, it seems to remain an open question as to whether or not the experiment was truly successful. So, back to St. Andrew’s. It sounds to me like Lotar is probably a lot like the woman who asked the St. Margaret’s people, back in 1999, do we really have to do this now? Is building our dream church in the suburbs really so pressing a need that we’ve got to spend millions of dollars on it that could be spent on the things Christ actually told us to do? I’m torn, because I understand his point, but I also understand the point of building. Now, that said, he makes some swipes that strike me — as someone admittedly unfamiliar with the situation, particularly in contrast to Lotar — as uncalled for; it’s simply not true that “the whole of world Orthodoxy” does Italianate-style iconography while it’s only crazy American converts that want “Byzantine anachronisms”. What is true is that there are different styles that have been employed over the centuries, it’s somewhat cyclical, and right now there is a revival of the “Byzantine style” going on, not only among American “pseudo-pious” crazies, but certainly in Greece and in Russia as well. In Athens, yes, any church that was built in the nineteenth century is going to have western-looking icons, but anything painted in the last few decades isn’t going to look like that. If his story about the Georgian family is accurate, then that hardly makes it excusable, but I’m left wondering if there might not be more to the story because of how he has otherwise oversimplified some things. My gut instinct is that there’s no way the Riverside project would have ever been justifiable in Lotar’s eyes; perhaps I’m wrong on that point, but I’m pretty sure that the answer the priest gave the woman at St. Margaret’s in 1999 didn’t turn her into a believer in the project, and from what I’ve encountered in various instances of these kinds of conversations, there are some disagreements that can only end in an angry standoff, with one side or the other bitterly claiming to having not been heard. That said, reading the piece Lotar links to, I wish the priest had given an answer that was more like the one the Episcopal priest gave twelve years ago — that there’s a plan that is getting us to where we think we need to be in order to do the things we’re supposed to do as a parish, and this building is part of that plan. It’s not that what he says is wrong, exactly — and I can’t speak one way or the other to Lotar’s rebuttal on St. Andrew’s involvement with ministries for the poor — but it does seem easily read as unnecessarily self-justifying. It doesn’t seem to me to have been intended that way, but publicly dismissing those with questions as “small-souled” comes across as awkwardly off-message to say the least. There is a way to answer the concerns that people have in the context of a building project, but marginalizing them isn’t the way to do it. As I say, I get the impression that Lotar’s contempt for the project was probably a given from the get-go (and was probably a function of contempt for the community itself, or at least some segment of it), so maybe there’s no way that the outcome would have been different. And maybe the thing that is unavoidable is that building projects are divisive. You’re not going to make everybody happy, you’re not going to be able to convince everybody that it needs to be done, you’re even not going to be able to convince everything that it isn’t a huge mistake. Yes, sometimes the naysayers are right; maybe they’re even right more often than we’d like to admit. I don’t know what the answer is; I don’t know if the Riverside church is a huge waste of money by a bunch of anachronistic and silly white people who are willfully skirting their obligations to the poor by building themselves a pretty toybox. I don’t know if All Saints needs to just get used to the idea that Orthodox Christianity in south central Indiana is a solution looking for a problem. I believe the concerns of somebody like Lotar need to be heard and taken seriously. I also believe that Fr. Josiah is right in that the answer to those concerns is “both/and” — but the question is, how do you articulate the “both/and” such that the the person who believes they need to ask, “What if we waited?” actually believes that they’ve been heard and taken seriously, and so that the “both/and” actually gets realized? That’s a lot harder. A strange and wonderful mystery I see, the Cave is heaven, the Virgin the Cherubic throne, the Manger the Place in which Christ, the God whom nothing can contain, is laid. Him we praise and magnify. Christ is born, glorify him! Merry Christmas! 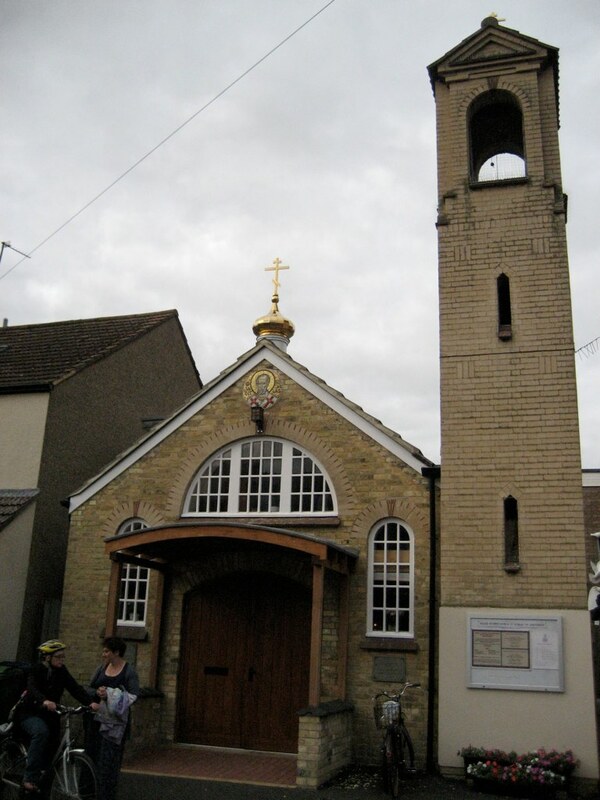 A couple of months ago, I wrote about getting to see St. Nicholas Orthodox Church in Oxford and the beautiful job they did renovating an old Anglican building. 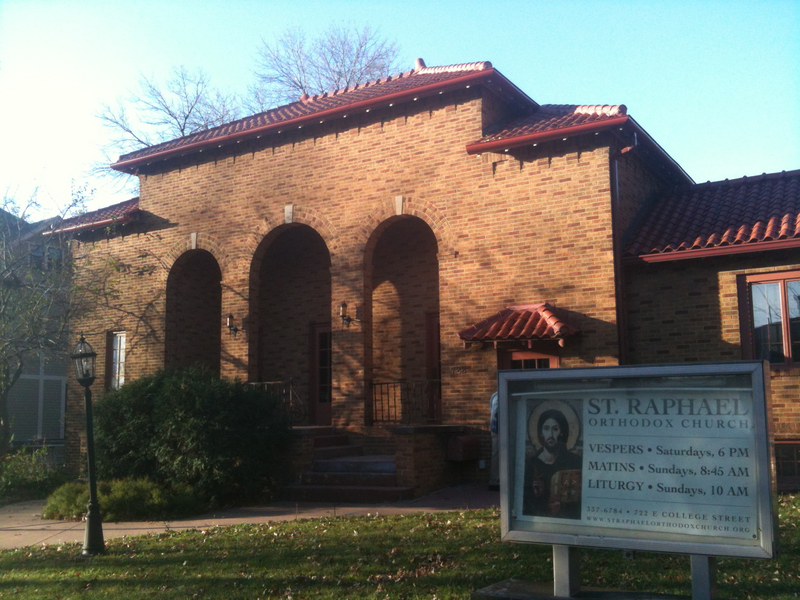 I also briefly mentioned St. Raphel of Brooklyn Orthodox Church in Iowa City as an example of similar work in America. At the parish website, you can see much of the work that they had to go through to transform the building; as with the St. Nicholas situation, I think there’s a lot there to learn for parishes that wind up acquiring pre-existing structures (first off, start with something that was designed for a use not entirely dissimilar to Orthodox liturgy — i.e., not a bank if you can at all manage it). It’s not easy to do it right, but it seems to me to be very much worth doing well regardless! Also as with the St. Nicholas situation, the parish very much had to take a leap of faith or five to take advantage of this opportunity; if you feel so inclined, I’d encourage you to make a contribution to their capital campaign as a show of support. Such things tend to come around when they go around, if you know what I mean. There doesn’t seem to be an electronic PayPal option, at least at this time, but I’m double-checking on that point. You can read the story about St. Nicholas Church for yourself, how they acquired the building and everything they’ve had to do to it, right here. I can’t really add to any of that, except that from what Fr. Stephen Platt told me, there is a garage next door that used to be the church hall back in the building’s Anglican mission days; he hopes that once the renovation work on the temple is paid off, they can buy the garage and turn it back into the church’s hall. My own observations are that the community has done a marvelous job of entering into this project with faith, and by doing so they acquired a building that was within short walking distance of many of the colleges — and it’s a lovely walk, too, on a footpath that takes you through a field and over water and so on — and is right smack dab in the middle of a residential area where there are people rather than being in the middle of nowhere. It’s a church that can actually be a visible witness to its neighborhood, and uniquely so, since the neighborhood has seen everything the parish has had to do to reclaim the building from being something of a severely under-utilized eyesore. I will also note that they’ve made it a point to first and foremost treat the building as a place of worship, and they have prioritized their efforts accordingly. I am familiar with phased church building projects where the approach is, “Well, people come to church for services, but they stay for everything else a church does, so best to build something that one can get by in for worship and that maximizes the ability to do all of the ancillary things. Then you’ll grow faster and can build the temple down the road.” I humbly submit that this approach doesn’t really work, at least not from what I’ve seen. The Church is first and foremost a worshipping body, not a coffee-drinking body, and when you put what is supposed to be our first priority in second place so that the men’s group has somewhere to meet, I think people sense that. Worse, from what I’ve seen, the ways you have to rethink your liturgical practice in a setting you’ve built only for the bare minimum of accommodation have a nasty tendency to become permanent. This means that if the day ever comes where you get to build the permanent temple, you’re already wondering, “Well, why do we need [X component of ecclesiastical architecture] anyway, when it adds another $250k to the price and we’ve learned how to get along just fine without it in our existing space?” By contrast, St. Nicholas has prioritized the liturgical function of the building over secondary activities, and it shows with the care they’ve put into their furnishings. They’ve clearly been able to do a lot with what resources they have, and they’ve also shown a lot of forethought in leaving the walls white so that they can be frescoed later. You can see all of my pictures of the church here. One more thing — as you can see from the PayPal button at the bottom of their page, they are still fundraising to pay off the five-year loan that allowed them to finance the building purchase in the first place. Whatever they can’t pay off in that timeframe (that is, by November 2013) will probably be converted to a standard bank loan, but obviously it’s a burden that it would be better to not have to carry for such a community, particularly if they hope to buy the hall in the future. I encourage anybody who is able to contribute something to this ongoing effort. While the existence of two (well, three) Orthodox parishes in Oxford may have come out of difficulty (and I won’t elaborate; you can find the story elsewhere if you like, and I myself am not certain I understand everything), God seems to have turned it around for good. May it continue to be so! About seven years ago, I was driving to Chicago from Bloomington for the first time. I was with my friend Jonathan Wey, and we were on our way (as it were) there to pick up my wife up from the airport (long story). Once we were in northwest Indiana, I eventually saw this largish structure several miles off in the distance. My first thought was that it looked like an Orthodox church, but no, surely it’s a grain silo — why would there be an Orthodox church so large it’s visible from the freeway in Indiana, of all places? As we got closer, however, it became clear that yes, it was an Orthodox church. Jonathan and I looked at each other, nodded, and I got off the highway so we could find it. It turned out to be St. Sava Serbian Orthodox Church in Merrillville (pictured), and there happened to be somebody there who let us in and showed us around. From what I remember, it’s a stunning building, lovingly constructed in every way, with an incredible attention to detail. St. Sava Church also appears to be the only place where one can buy prints of St. Varnava, the first (and so far only) Orthodox saint from Indiana. 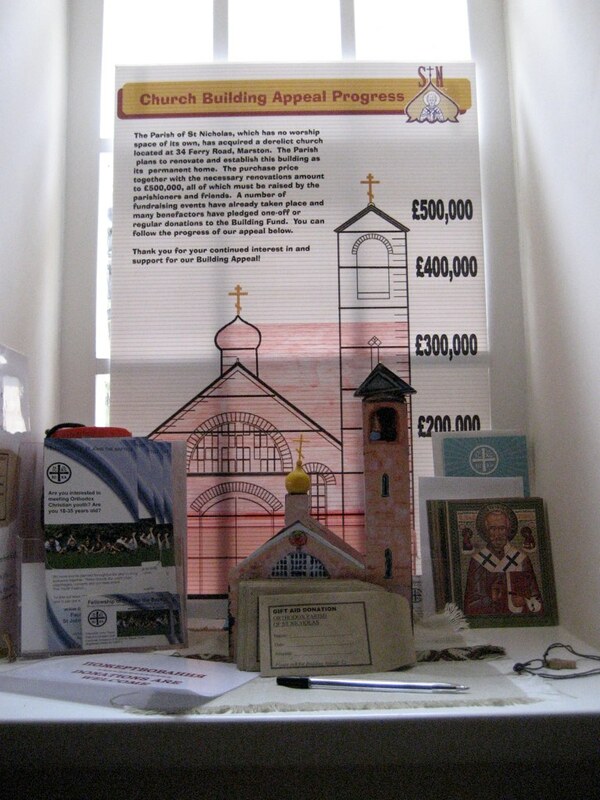 I ordered one so that my wife could give it to the Russian church in Kiel that has been so hospitable to her over the last year, and when it arrived this week, they had also enclosed a little booklet titled “St. Sava Serbian Orthodox Church Visitor’s Guide”. It’s a lovely, professionally-produced spiral-bound publication that contains a history of the parish, details about the iconography, bells, and external mosaics, liturgical furnishings, and general information about Orthodox Christianity. Our present church was built on 140 acres… land purchased by the Church-School Congregation following [the burning down of the old building]… [T]he Priest and the Church Board undertook plans to finance and erect… what would be the “church of our dreams” in a “once-in-a-lifetime endeavor”. That seed having been planted, it gave birth to an ideal that included every church organization. Building and finance professionals helped to nurture the seed and guide its growth. It flowered as our unsolicited volunteers weed their labor-intensive work which epitomized God’s truth that “faith without work is dead”. All contributed their time, knowledge, talent and money to the church that would glorify God in the Divine Liturgy. Saint Sava Serbian Orthodox Church was designed to conform with the spirit of Orthodox teaching. According to Orthodox belief, God is eternal King. Hence the church building, which is the sacred home for the worship of God, should be royal in every aspect. Orthodox Christians have always built their churches with that in mind and have always put into the church everything that they regarded as the best: the sturdiest building materials, the most beautiful adornments and the most costly utensils and vestments they could afford… Earthly royal splendor has always served as a pattern for the expression of heavenly glory. Orthodox church buildings are designed with the intention to make God, the Heavenly Kingdom and Salvation seem sensibly real and present. 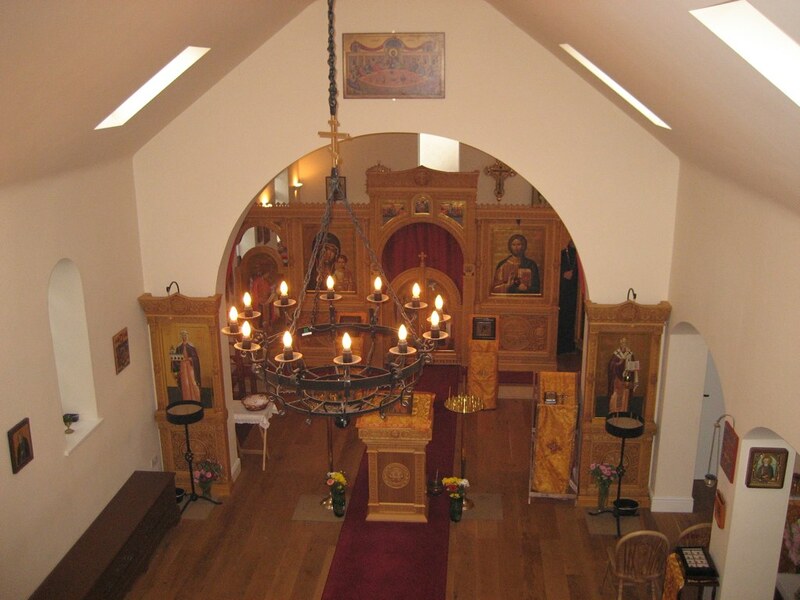 Orthodox church have strict guidelines they must follow when building a church. The structure of church buildings is usually in the design of a ship or a cross. The ship plan resembles and signifies the ark of Noah in which he and his family were saved from the flood, while the cross plan reminds Christians of the Cross upon which Jesus Christ was crucified. Strict Orthodox Church guidelines detail that the length of the building must run parallel to the east-west line, so that the church sanctuary is always facing east. Saint John of Damascus (d.753) affirms that it is an Apostolic Tradition to worship facing east. The main entrance to the church is always through the western portal. Most churches have two side doors, the northern and the southern, and Saint Sava Church was built in accordance to all these traditions. Byzantine architecture evolved from the Roman in the 6th century. The most popular Byzantine plan is a cross pattern in a square. The building is topped by a cupola, a cylindrical or polygonal drum covered with a dome, with narrow arched windows cut all around the concave space. Oftentimes in Byzantine architecture, the central dome is surrounded by several smaller cupolas on a lower level. Crosses embellish the top of every dome and belfry, signifying the church is glorification of the Crucified Lord and Saviour Jesus Christ. A great number of Serbian churches and monasteries have been built in the Byzantine style. Originality is expressed both in the design and the ornamentation, and no two churches are alike. Every church can be unique within traditional guidelines. 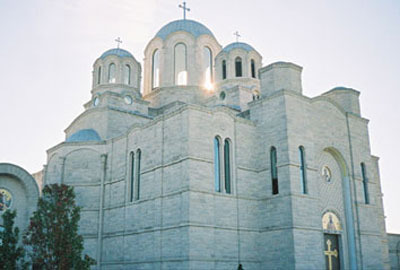 Saint Sava in Merrillville was patterned after the church in Topola, Serbia, but differs with its columns and its west-facing windows. All church buildings must be consecrated by a bishop before a Divine Liturgy can be celebrated. When a church is consecrated or christened, Kumovi (sponsors) are chosen. Glisho Rapaich, Michael and Yvonne Galich served as Kumovi to Saint Sava Church. Every Orthodox Church is dedicated to a Holy Event in the life of Jesus Christ; to the Most Pure Mother of God; to the Holy Trinity; to the Archangels Michael or Gabriel; to the Holy Apostles or to a Saint or Martyr for Jesus Christ. The church of Saint Sava in Merrillville is a magnificent edifice which attracts great interest. People who see it from a distance are drawn to visit it personally (pp1-3). So the building first and foremost is for the glory of God, being tangible, material icon of the Heavenly Kingdom on earth. The building itself is rooted firmly in the witness to Apostolic Tradition, the wider history of the oikoumene, that is to say, the Christian Roman Empire, and the specific, local history of Serbia. This adherence to tradition is confirmed by the whole Church, in the person of the Bishop, the people, and those in heaven with whom we worship. And, finally, this is done for the benefit of the larger community, not just for those who attend the church. The church building, in other words, is not incidental; it’s not just a random gathering of four walls and roof that only the Orthodox in a given area know about. It is an image of the Kingdom, and a witness to both the entirety of the faith and the unity of the Church for all who might see it. A lot of this we’ve heard before in the abstract, but here is an amazing, concrete example of a community making it happen. I read a book a few months ago called When Not To Build. It’s written by a former Protestant church architect who became convinced that building new buildings is a distraction for congregations, and that churches are better off treating their buildings as more-or-less necessary evils for the purposes of gathering as we’re commanded, but beyond that, the building of big, expensive buildings is a money-pit and something that prevents churches from doing what they’re actually supposed to be doing. It’s a book that has some decent practical suggestions, to be sure, but much of it is problematic from an Orthodox point of view — it embraces the narrative of of post-legalization decline, certainly, and it has no patience whatsoever for a theology that would treat the building as having any kind of an iconographic function. Problematic though it may be, it genuinely seems to be how a lot of people think. For the last six years, I have been part of the conversations at my parish towards building our permanent building, and these conversations continually circle back around themselves and go nowhere. Some of it has to do with money, but I think a lot of it has to do with being genuinely baffled at the idea that the building has any or all of the iconographic and traditional functions outlined by Andrew Gould and the people of St. Sava Church, and certainly the notion that the church building itself is intended to reflect royal splendor in materials and design runs contrary to Middle American ideals about avoiding conspicuous consumption. For some, it need be no more complex than a practical question of space to be solved practically — build whatever size pole barn or brick box you can manage, and retrofit a dome on top of it if it’s really that important to you for it to look “Orthodox”, whatever that means. Anything else is surely just too theoretical and abstract to be relevant to those of us here and now who have to build and use the place. I’ve even heard it suggested that building a beautiful church building is something that materially wealthy but spiritually dead communities do (usually implied somewhere along the way that these are “ethnic” parishes in addition), and that parishes that are spiritually alive (i.e., “convert” parishes) don’t need such trappings. When Gould was here, he spent some time talking about multi-aisle design of his interiors, complete with interior columns and transepts, and how there’s a traditional diversity of kinds of spaces inside the church. Somebody asked a question that amounted to, well, so what? Why is anybody here going to think that that’s a good thing? It contributes to the beauty of the nave, Gould replied. “I don’t come to church for the beauty, I come for the participation,” was the answer. Now, to be fair, there’s evidently something of an assumption somewhere that multi-aisle designs are problematic or at least unnecessary in an American context; in the St. Sava booklet, it says that “we preserved the original model and its general characteristics of style and beauty, with additional attributes more practical to serve the religious needs of an American parish. The use of steel eliminated the need for interior columns in the nave…” (p.3) Still, it’s clear that St. Sava Church, in making those kinds of decisions, tried to work things out in the context of a traditional understanding of these matters, rather than an approach that assumes that the traditional practices are irrelevant and impractical. At the same time, the St. Sava booklet acknowledges all of this, giving an account of things that makes it clear that the entire community made it its responsibility to contribute sacrificially of time, talent, and effort to build a church that would be an Orthodox witness to an entire area. They wanted people to see it from the highway and pull off to find it, and they were willing to do what they had to in order to make it happen. Maybe not everybody wants that, I suppose, but it seems to me that there’s a problem when we on the one hand criticize “ethnic” parishes for being insular and functioning as “little more than the tribe at prayer” and then set up churches in places that are hard to find, inaccessible, and invisible. However “ethnic” St. Sava may or may not be (and I don’t know, having never been there except for that afternoon), you can’t come down on them for trying to stay unnoticed. I’m not entirely certain how to put all of these pieces together. Is a true “culturally American Orthodox Christianity” going to reflect a core frugality and practicality that sees the architectural and iconographic traditions as ostentatious and unnecessary? Are former bank buildings and insurance offices adapted as well as possible for liturgical use what we’re looking at? I suppose you could argue that church buildings started out as converted temples and public buildings, but it seems to me that that’s a different kettle of fish entirely. Do we get that there’s a difference between chronos and kairos, and that the church is built for one and not the other? Is beauty in Orthodox worship and building design something we’re going to have to redefine along American egalitarian, “horizontal” lines in order for it to be “relevant” enough? Is it a case where, if we see examples like St. Sava, we’ll be inspired to do it ourselves? Or is it a case where examples like St. Sava make us think, “Yeah, how nice for them. Nothing to do with us”? When Andrew Gould was here back in January, he talked about having just gotten back from the Netherlands, where he had been hired to design a church for St. Cornelius Orthodox Church, a Moscow Patriarchate parish in Amersfoort. Hearing him talk about the experience was fascinating, and it made me very curious about what he was going to come up with for them. Curiosity is no longer required; Andrew has posted his designs on his website, and I link to them for your perusal. My hope is that in the very near future we are able to move forward with engaging Andrew to do the full design. The concept sketch is excellent to have and has been wonderfully useful, but we’re running out of steps we can take where it will be sufficient. If you might be interested in helping in some way, I refer you over this way.